Everyone needs a dish they can pull out of thin air and impress strangers with. Many people have several. I have one. And I am grateful. No. I'm not talking about the dish in the photo. Oy. This dish has accompanied me to every potluck and every picnic I've attended in the last ten years. It's a concoction that not only tastes good, but looks good too. More to the point, it makes me look good. No matter where I take it, invariably at least three people will approach on hands and knees, begging for the recipe. They've devoured their plate, noted that the communal plate has been consumed in the five minutes it took them to digest, and they make the assumption that this dish is a complicated, secret recipe of my own devising. If I were a more clever woman, I would play on this assumption. Except that would mean I'd be expected to follow up my bravado with a dinner party or something. And that, as readers of this blog know all too well, is a feat I can't much pull off. So I quickly cop to the truth. Vegetable Couscous. It's a simple recipe, pulled from Jeanne Lemlin's mighty Quick Vegetarian Pleasures. It involves the chopping of an onion and two small zucchini squash, plus measuring out a few spices. Also, the making of some couscous, which in this day and age, with a Trader Joe's around the corner, is an instant, almost idiot-proof task. Yes, thank you, even I can do it. Usually with some semblance of success. heat the oil in a large skillet over medium high heat. Add the garlic and onion and saute for a few minutes. Add the spices, and cook a few minutes more, stirring often. Stir in the zucchini, chick peas, followed by the tomatoes, then the raisins. Cover the pan and lower heat to medium. Cook, stirring occasionally, about 15 to 20 minutes, or until the zucchini is tender. While the vegetables are brewing, prepare the couscous. Bring the veggie stock to a boil with butter and salt (if you're using it, and I say, life's too short not to use butter whenever you can). Stir in the couscous, cover tightly and remove from heat. Let it sit 5 minutes, or however long it takes you to finish the veggies. Fluff with a fork before serving. You can make the vegetable part of this dish a day or two before with nothing but upside flavor potential. Impress everyone by serving the couscous in an audacious Moroccan bowl with the veggie mixture mounded in the center. A final aside: Quick Vegetarian Pleasures is one of those rare cookbooks in which almost every entree is a winner. Simple, sure. But even snobs have to enjoy good eatin'. Quick: What's the most satisfying meal you've ever had? I bet you have several. The perfect meal is hard to pin down because they're all about context. Where are you? How hungry are you? Who are you with? Where did you just come from? What did you do just prior to this perfect meal? Like you, I have several perfect meals. None of them are fancy. In fact, most are not even technically "meals." They're more memorable tastes. For example, whenever I go to Berkeley my first stop bar none is Gordo's Taqueria, where I sit and eat my black bean, cheese and rice burrito (with just a dollop of sour cream) in a state of complete and silent bliss. In Santa Cruz there's a bistro called Gabriella's that serves fresh figs wrapped in prosciutto...the only possible response to which is delighted, astounded, laughter. In North London there's a storefront restaurant with samosas that will render you mute, especially if you haven't had a bite of Indian food in eight, nine months but have spent every day of that time daydreaming about it. The crawfish at the Cuban place in Orange. The blue fin tuna in Studio City. The egg bagel just out of the oven in New York. That salt cod and garlic dish a friend made on New Year's eve 1999. The meat and potato stew my neighbor brought over an hour after I gave birth to my son, at home. A bowl I finished in minutes and literally licked clean, while my neighbor, a big and radiant woman from Kenya, laughed all the way back to her apartment to retrieve the entire pot for me. Here's a more recent perfect meal: A grilled cheese sandwich and a pickle. Washed down with a $14 glass of red wine. Tony and I discovered this one at Greenblatt's about a year or so ago. Greenblatt's is a Jewish Deli on Sunset in LA. It's been there for at least 50 years. It's got much better food than the more famous Canter's Deli on Fairfax. As well as a vaunted wine collection. It's open late and we like to go after a show and slump in a booth and watch the Hollywood people come and go. One night we were trying to decide what to eat. "Know what I really feel like?" Tony looked over his menu sheepishly. My last experience with grilled cheese had something to do with a slice of American cheese between two pieces of Wonder Bread. There is a lot to choose from on the Greenblatt's menu, all of it worthy. So eyebrows were raised. But not for long. Imagine a place that serves grilled cheese sandwiches for adults...yeah, I know. Tart up a grilled cheese and call it a panini. It's still just a grilled cheese to me -- and that can be more than OK. Tony ordered jack cheese on rye bread. Creaminess with a bite. And then there's that pickle, which is like a satisfying, final exclamation point. I don't know how we came to order the $14 glass of wine. A cab out of Napa somewhere. Our waiter, the tall and improbably-named Gide, told us it would be good. 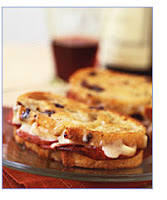 And who the hell has a decent wine with a grilled cheese? Well, exactly. And thus a classic perfect meal was born. There's a lot more to be written about grilled cheese sandwiches. They're popping up all over. In the Williams Sonoma catalog, in the New York Times (which irritatingly cancels its free links within days), to the food blogosphere. There are contests. All sorts of grilled cheese chatter. They've also gotten the nod from the heavens. Seems God, some ten years ago, saw fit to affix an image of the Virgin Mary into a toasted cheese sandwich. True believers have been making pilgrimages to see this holiest of grilled cheese in Florida (where else?) until recently, when it was sold at auction on Ebay for $28,000. I could write a lot more about grilled cheese sandwiches. Even detail my pseudo-successful attempts at making them at home. But not today. I know you have a favorite meal or two. Let's hear them.